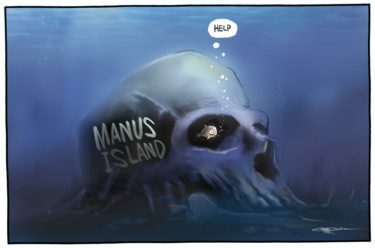 CRNI joins with IFEX, Australia’s Media, Entertainment & Arts Alliance, the International Federation of Journalists (Asia-Pacific) and other freedom of expression organizations in once again calling upon the government of Australia to release a trio of Iranian nationals from their detention centre on Manus Island, Papua New Guinea most especially Eaten Fish, last year’s recipient of our Courage in Editorial Cartooning Award. • Behrouz Boochani, 33, is a Kurdish journalist. He has worked as a journalist and editor for several Iranian newspapers. On February 17, 2013, the Islamic Revolutionary Guards Corps ransacked his offices in Ilam and arrested 11 of Boochani’s colleagues. Six were imprisoned. He has courageously continued to work as a journalist while in detention, and is a regular contributor to publications in Australia and overseas, often reporting on the situation and conditions on Manus Island. He has been recognised as a refugee and we urge you to allow him to reside in Australia to resume his career as a journalist. Boochani is a Main Case of PEN International and has been recognised as a detained journalist by Reporters Without Borders (RSF). • Mehdi Savari, 31, is an Ahwazi performer. As an actor, he has worked with numerous theatre troupes in many cities and villages in Iran, and performed for audiences in open public places. He was also well-known as the host of a satirical children’s TV show before fleeing Iran. Mehdi is a person of short stature, and has met with severe discrimination over his life, which has been exacerbated by the conditions and his treatment on Manus Island over the last three years, and he continues to suffer a range of physical ailments and indignities, as well as regular bouts of depression and chronic pain. As he has also been recognised as a refugee, we urge you to facilitate his resettlement in Australia. We also refer you to a resolution passed by the International Federation of Actors congress in Sao Paulo, Brazil, in September calling for his release from detention. • Eaten Fish, 24, is a cartoonist and artist who prefers to be known by his nom-de-plume. He has recently received Cartoonists’ Rights Network International’s 2016 award for Courage in Editorial Cartooning. His application for refugee status has not been assessed. Since he was detained at Manus Island, he has been diagnosed with mental illnesses, which have been compounded by his incarceration. We urge you to allow him to live in Australia until the final status of his claim can be determined.